The Rules: Maintain your cover, outwit the Gestapo, and never fall in love with your partner. Winner of the 2015 Whitney Award for Best Historical Novel. The Rules in Rome comes in paperback, ebook, and audio book (narrated by Jason Tatom). Available in most LDS bookstores and online at Amazon, Barnes & Noble, Deseret Book, and Seagull Book. Here are some pdfs that may enrich your reading: The Rules in Rome Bookclub Questions, The Rules in Rome Pronunciation Guide, The Rules in Rome, deleted scenes, normal text size, and The Rules in Rome, deleted scenes, large text size. 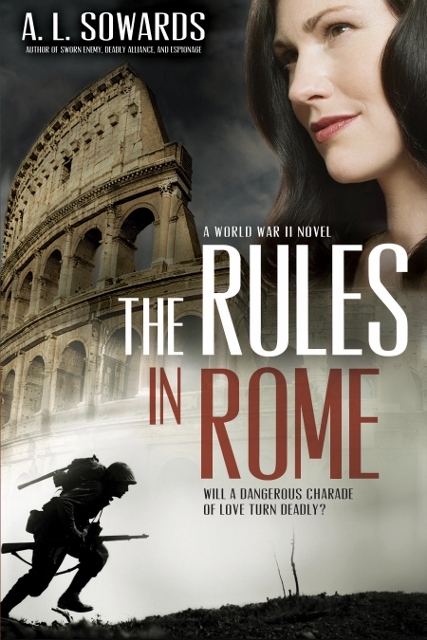 Readers who hunger for a great espionage thriller with an extra helping of romance will devour The Rules in Rome. A.L. Sowards is at the top of her craft with this terrific WWII suspense novel. It is definitely a book not to be missed! The Rules In Rome has it all. Romance, adventure, and epic themes illustrating the unconquerable human spirit. From the moment Gracie met Bastien, I knew I would love this book. He’s the perfect hero, Gracie is his match. I fell in love with these characters over and over again. Thank you, Sowards, for another fabulous read! More reviews available on Goodreads, Amazon, Deseret News, Meridian Magazine, My Book a Day, I am a Reader, LDS and Lovin’ It, Katie’s Clean Book Collection, Joy in the Moments, Getting Your Read On, Wishful Endings, Bookworm Lisa, I Love to Read and Review Books, Mel’s Shelves, Rockin’ Book Reviews, Literary Time Out, Min Reads and Reviews, and LDS Women’s Book Review, with interviews about the book on Flashlight Commentary, and I am a Reader. Published by Covenant, February 2015. ISBN 978-1-62108-882-0; Kindle ASIN: B00SNW0ESA, Audio ISBN:1621088839.